Continuing with our quality standards- our Fitness Center will be unavailable from January 15 - 31 due to renovations. We apologize for the inconvenience. discover Pennsylvania*s Great Lakes region... welcome to the Hampton Inn-Meadville PA. 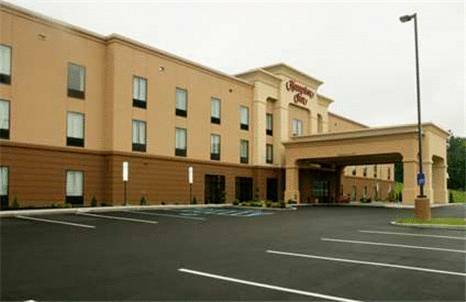 The Hampton Inn Meadville hotel sits in the heart of Pennsylvania*s Great Lakes region in beautiful Crawford County. As our guest you*ll be minutes from the historic downtown area scenic Route 6 a bustling marketplace family farms an array of wineries exciting Waldameer Park - Waterpark and more. Enjoy fishing swimming and camping at Woodcock Creek Lake. Peruse the quaint shops and historic buildings that make up our downtown area including Market House Baldwin/Reynolds House Diamond Park and more. Take a drive on Route 6 touted as *one of America*s most scenic drives by National Geographic. Enjoy a pulse-pounding ride on Waldameer Park*s Ravine Flyer II one of the largest new wooden coasters in the U.S. Pick up something special at All Seasons Marketplace and Flea Market in Erie. Sip wine at Angeli Winery in Titusville or at the many other nearby wineries. Here on business. Port Meadville Airport is minutes away as are companies like Channellock Dad*s Dog Food Advanced Cast and Starlight Diversified as well as Allegheny and Thiel colleges and Edinboro University. Discover Pennsylvania*s Great Lakes region at the Hampton Inn. RESERVATIONS MUST BE CANCELED 1DAY/24HOURS PRIOR TO DAY OF ARRIVAL LOCAL HOTEL TIME TO AVOID A PENALTY FEE.